Figure 11b: Comparison of the observed distribution of temperature changes (ACIA, 2004) and the simulation (hindcasting) by the IPCC arctic group. It is of great interest to ask if GCMs can reproduce this geographic distribution of the observed changes shown in the upper part of Figure 11a, since the IPCC seems to claim to be able to reproduce the 0.6°C/100 years rise caused by the greenhouse effect of CO2. The IPCC arctic group (consisting of 14 sub-groups headed by V. Kattsov) “hindcasted” the geographic distribution of the temperature change during the last half of the 20th century. (To “hindcast” means to ask whether a model can reproduce results that match the known observations of the past; if a model can do this at least qualitatively, we can be much more confident about the present GCMs and their prediction of future conditions.) Their results were compiled by Bill Chapman, of the University of Illinois, and are shown in the right side of Figure 11b. The left side of the figure is taken from the ACIA Report (2004), which shows a trend similar to that shown in the upper part of Figure 11a, namely prominent warming in the continental Arctic and cooling in Greenland. This comparison was undertaken at the International Arctic Research Center, University of Alaska, in an attempt to reduce differences between the observations and modeling results, because they are expected to be similar, even if not the same. It was a great surprise to find significant differences between the two diagrams in Figure 11b. If both were reasonably accurate, they should at least look alike. Ideally, the pattern of change modeled by the GCMs should be identical or very similar to the pattern seen in the measured data. It was expected that the present GCMs would reproduce the observed pattern with at least reasonable fidelity. However, as can be seen in Figure 11b, there was no resemblance at all between the two, even qualitatively. In particular, the GCMs could not reproduce the warming in the continental Arctic, the most prominent feature in both Figure 11a (the upper part) and Figure 11b (the left side). It is natural to consider that this surprising result was due to the fact that the GCMs might still not be advanced enough for hindcasting. However, this possibility is inconceivable, because the increase of CO2 measured in the past is correctly used in the hindcasting, and everything we know about the CO2 effects so far is included in the computation. If the greenhouse effect caused the warming, the observed pattern should be reproducible at least qualitatively by these models, even if the reproduction is not perfect. It was a great puzzle for several weeks to account for the great differences. After some consideration, we began to realize another possible implication of this discrepancy: If 14 GCMs cannot reproduce prominent warming in the continental Arctic even qualitatively, perhaps much of this particular warming is not caused by the greenhouse effect of CO2 at all. That is to say, if it is not caused by the greenhouse effect, the warming of the continental Arctic cannot be reproduced even qualitatively by the GCMs. This would be because 14 GCMs do not contain the processes that caused the continental Arctic warming/cooling. More information about Dr Akasofu can be found here. The complete paper can be downloaded here (warning - it's 52 MB!). The EC has contributed €15 million of funding to the ENSEMBLES project. In addition, some partners were selffunding (receiving no money from the EC), either paying for their contribution themselves or being funded by governments outside the EC. A further 35 partners matched the funding that they received from the EC. The total amount spent on the project came to €22.8 million, which funded over 250 personyears of work. The four lower frames shows the hindcasts made by various models, the top frame shows the observations. It is obvious that all the models fail to capture important aspects of the climate system. warming of the South Indian Ocean. In any other field but climate modeling these hindcasts would lead to the rejection of the tested models. 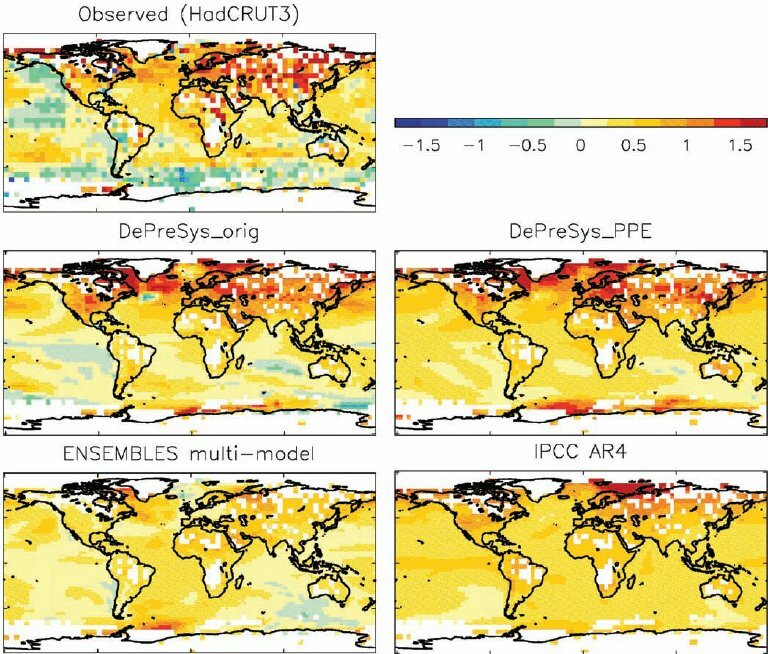 The models do not predict observed temperature changes. This is what the European taxpayer gets for €22.8 million.